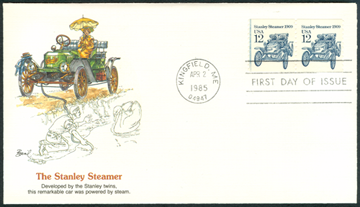 On April 2, 1985, the United States Postal Service issued a 12 Cent stamp in its Transportation Series that featured a 1909 Stanley Steam Car. 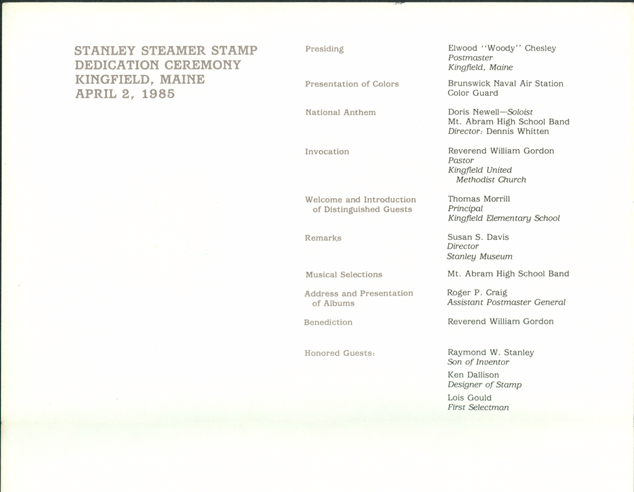 The event took place in Kingfield, ME at the Stanley Museum, and was a major event for the growing institution. 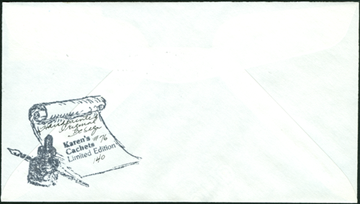 As is usual and customary, artists created postal caches to celebrate the event. Some are limited edition, hand painted, and artist signed. Other coves are mass produced. 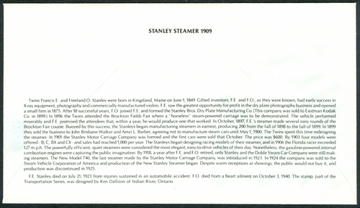 Indeed, the Stanley Museum has a huge inventory of these first day coves and you can support the Museum by purchasing one. 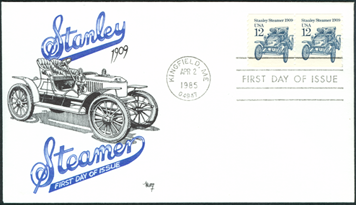 While somewhat comprehensive, this collection is far from definitive and there are certainly Stanley Stamp First Day Covers not represented here. Artist Signed and Limited Edition Covers. These covers are the most interesting visually. 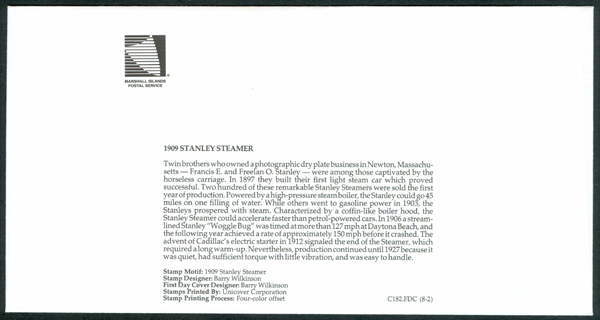 Many were produced in limited editions with the artist signing each and indicating its number in the series, such as 49/75, which means it is the 49th cover in a limited edition of 75 made. 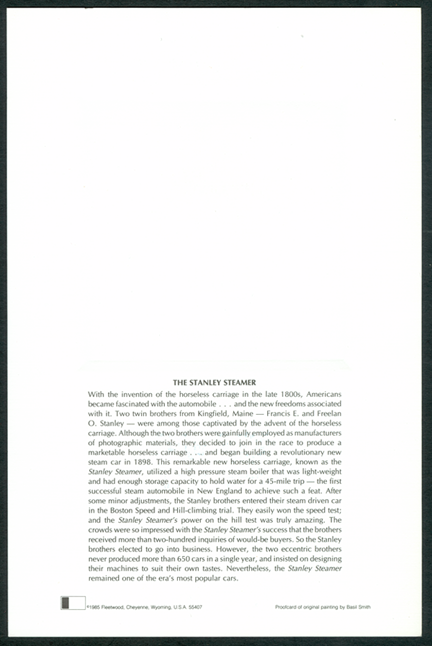 One cover below is unique. 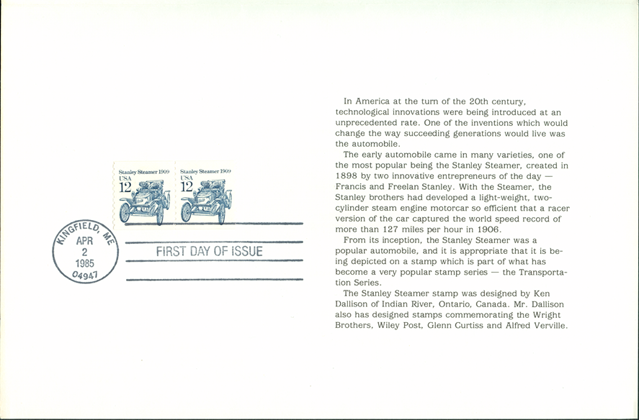 It is marked 1/1, meaning it is number one of an issue of one. This artist-signed cover is by Lori Murphy. It is 1 of 1, which apparently makes it unique. 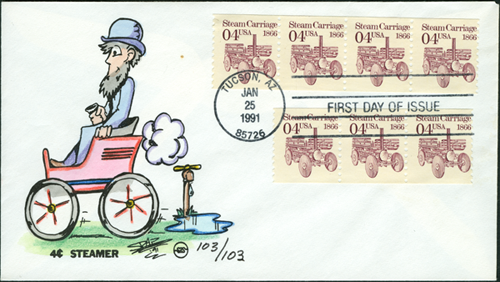 This is number 5 of an issue of 25 first day covers created by Kribbs' Kover of Jekyl Island, GA. This cachet is serial no. 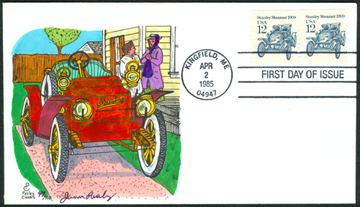 1 of a limited edition of 25 created b y Ken Kribbs during 20 plus years as a cachetmaker. This was part of the Artist's private collection, as he kept cover No. 1 of each of the cachets he created. Generally the number one is never sold, but is retained for the artist and his family. 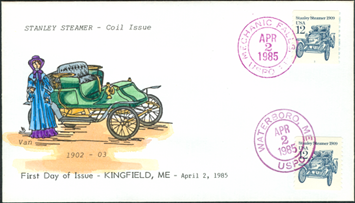 Ken Kribbs began his career as a cachet artist in 1978 by hand-drawing then hand-painting each one individually. After several years his wife Angie was trained as an artist and then trusted with the painting of each one. 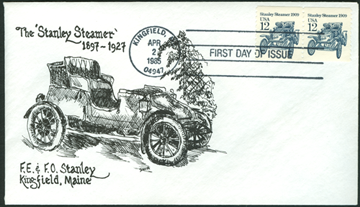 Shown here is a cachet produced for Scott 2332 the Stanley Steamer 12c Transportation Coil. 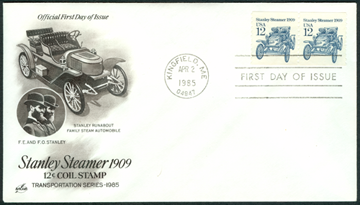 Shown through the coutesy of Sharon Klinger of Malibu Philatelic Covers. This cover is in a private collection. 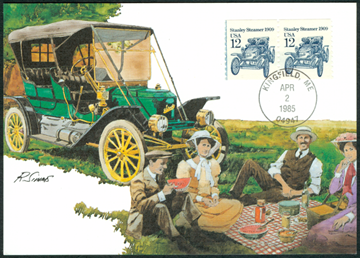 This is number 42 of an issue of 60 signed by the artist Hiram Swindall. 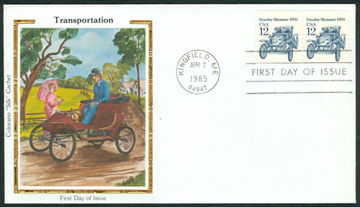 This is an unnumbered and uncolored cachet by the artist Hiram Swindall. 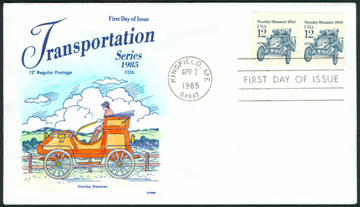 Budeck Cachet produced this cover. It is number 7 in a total run of 54 covers. 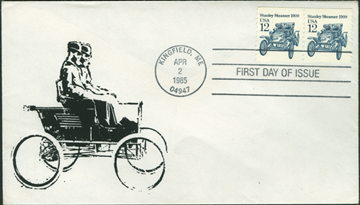 Tiny Cindella produced this cachet. It is number 12 in a total run of 15 covers. This is Karen Sabinsky's cachet, number 76 of 140 printed. 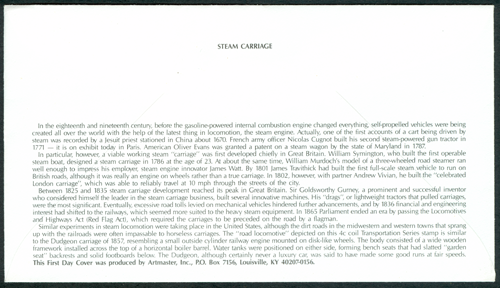 Interestingly, the Virtual Steam Car Museum incidentally acquired a second copy of this cachet and it too is number 76 of 140! 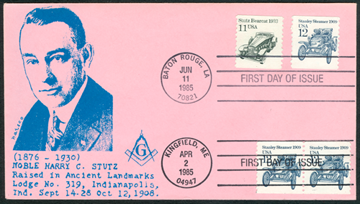 This first day cover postcard is number 2 of 32 produced by the Maximum Card Collection. 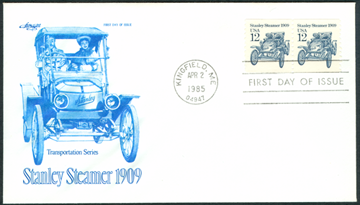 The cachet carries the initials H F and is marked American Postal Arts Society Limited Edition. There is another version of this artwork below. 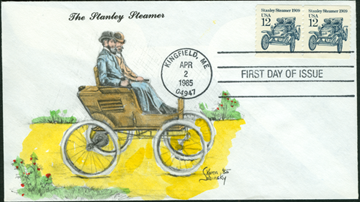 The cachet carries the initials H F.
This cachet drawing is signed SWA. 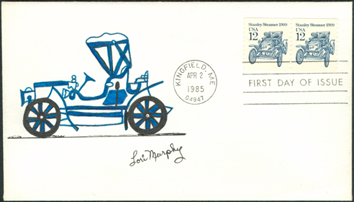 These mass produced covers are delightful but much more common than the artist signed covers. They are frequently found on eBay at nominal prices. 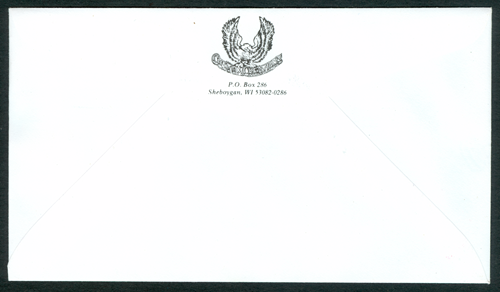 This cachet carries an American Eagle holding an American Flag that is reminiscent of a Civil War cover. 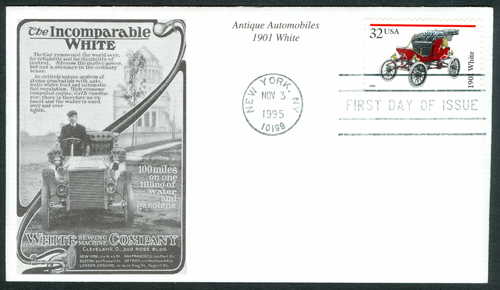 This cachet was produced in large numbers by Artcraft Covers. 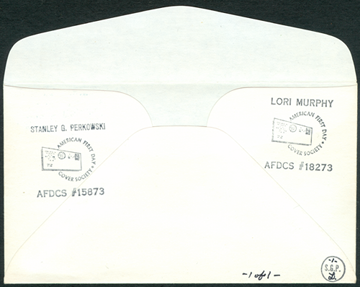 The cancellations on these two covers are strikingly different. This version of the same image is in blue. 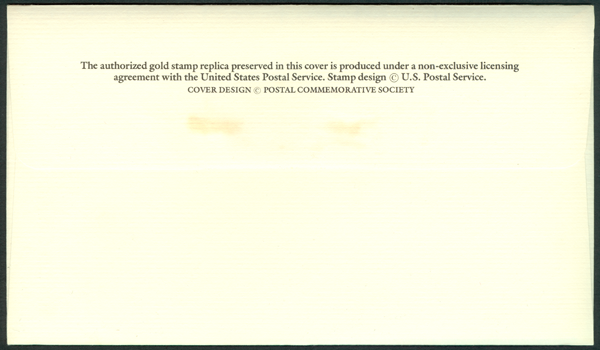 The small circular image reads Postal Commemorative Society. 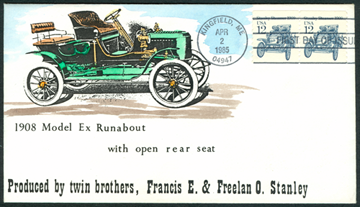 This cachet picks up the image of F. E. and F. O. Stanley pictured in their first car. 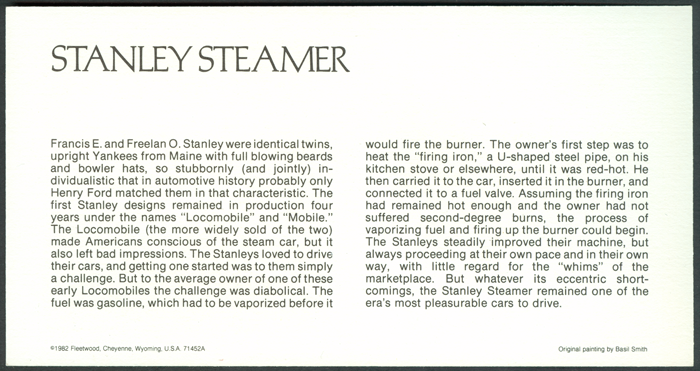 In includes a minor mistake, identifying the Stanley Twins as W. E. & W. O. Stanley. 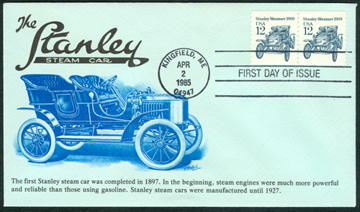 This cachet illustrates an early Stanley vehicle and identifies the makers as Francis and Freelan Stanley. 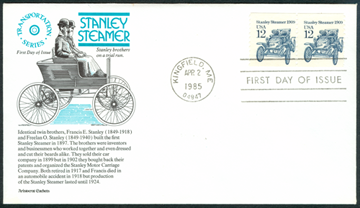 Why there is a 12 cent Henry Ford stamp on the envelope rather than a second 12 cent Stanley stamp is not known. 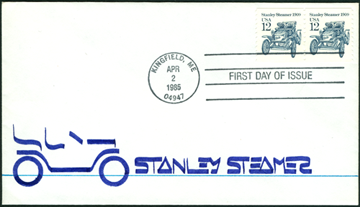 It is not clear why this cover includes Stanley stamps with a single Stutz stamp and two first day cover cancellations. 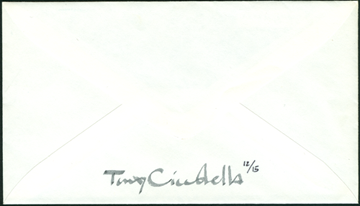 The cachet carries the signature Collins in the lower left. 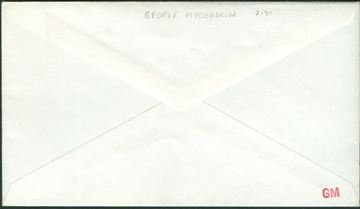 The cachet carries the signature Colorano "Silk" Cachet on the far left edge. 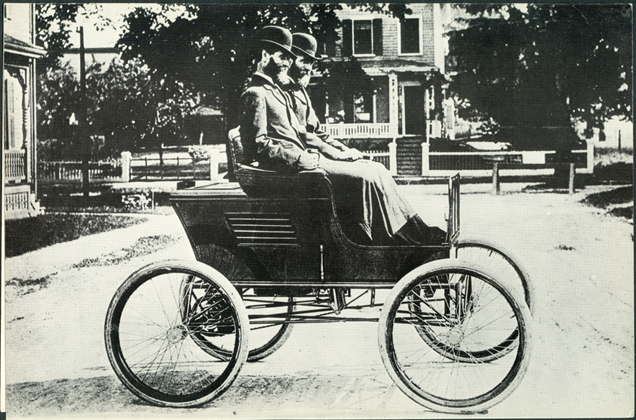 The cachet was produced by Fleetwood. See the Proof Below. 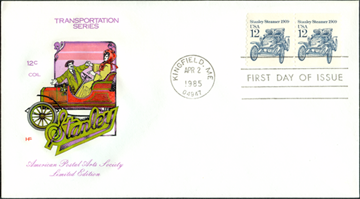 The cachet was designed by Ken Dallison of Indian River, OR. 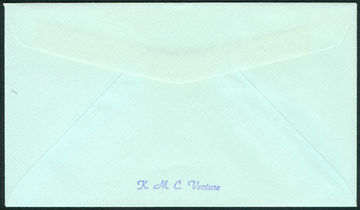 The cachet is stamped K. M. C. Ventuze on the envelope's reverse. 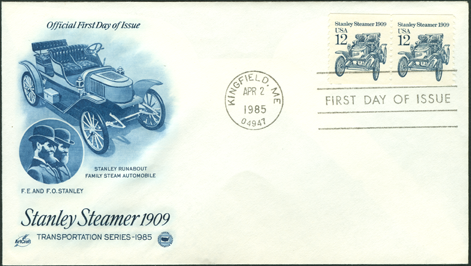 This cachet is signed Ron Myers Cachets and carries a rather modern transportation image given the 1909 Stanley Steam Car on the stamp. 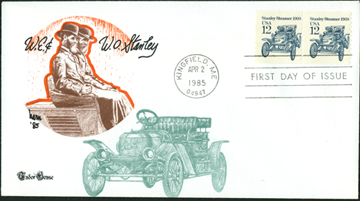 The cachet is signed Ellis and shows a comic character holding an image of the 1909 Stanley featured on the newly released stamps. 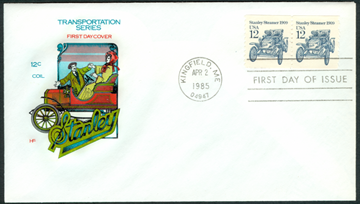 The cachet is signed Marcy in the lower right corner. 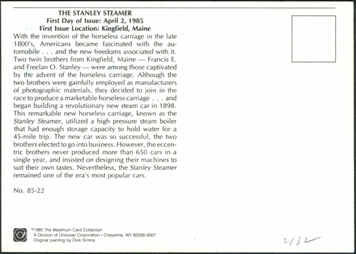 The signature Jean Risby appears below the Stanley it is 49 or 100 cachets. These cachets carry the artist name Van. 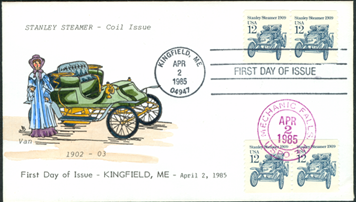 The cachet on the right carries the April 2, 1985 Firt Day of Issue Cancellation from Kingfield, ME, along with a hand stamp from Mechanic Falls, ME for the same day. 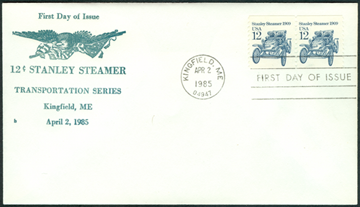 The cover at the left carries the same Mechanic Falls, ME hand stamp along with a Waterboro, ME hand cancellation of the same day. 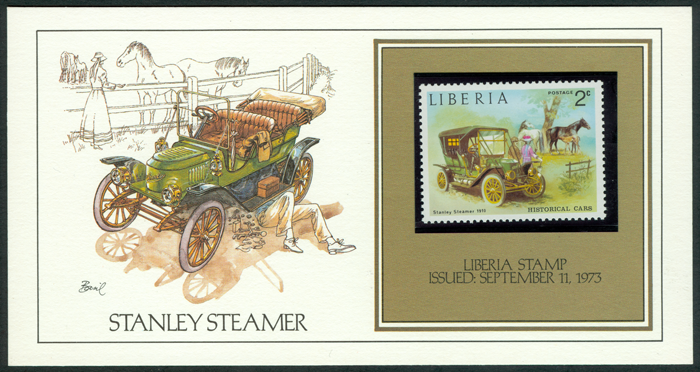 Foreign countries have been producing stamps for stamp collectors for decades. 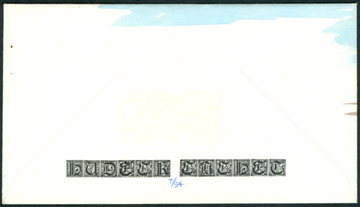 These stamps were never used in their country of origin, but made exclusively for external sale. Some are very nicely done. 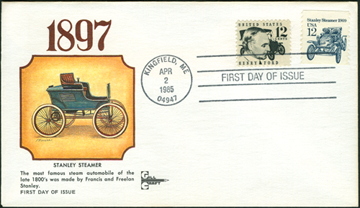 The White Steam Car is also featured on a United States Postage Stamp. 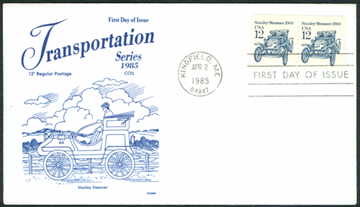 It, however, did not draw the attention that the Stanley Transportation Series stamp drew, and there are only a few covers celebrating the stamp's appearance. 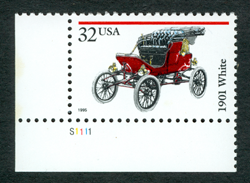 The 32 cent postage stamp honoring the 1901 White Steam Car was issued on November 3, 1995. 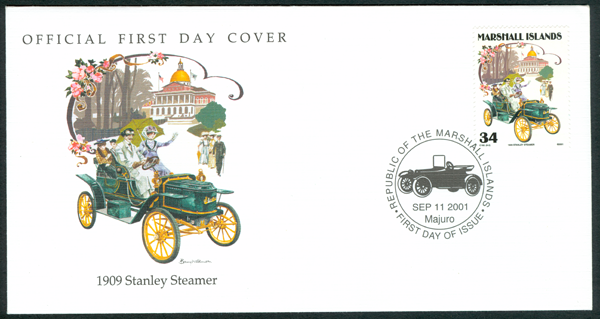 The Mystic Stamp Company produced this first day cover for the November 3, 1995 relesae date. 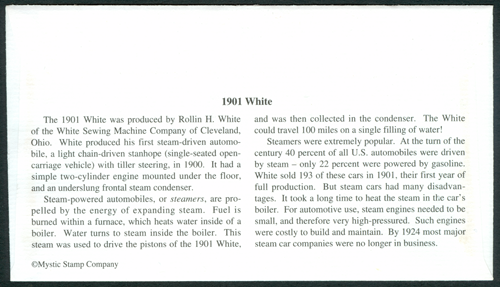 It features a later White Steam Car. 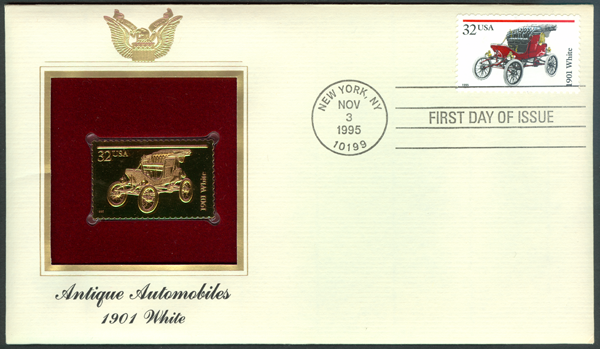 The Postal Commeratlve Society created this gold replica stamp for its version of the 1901 White Steam Car stamp. 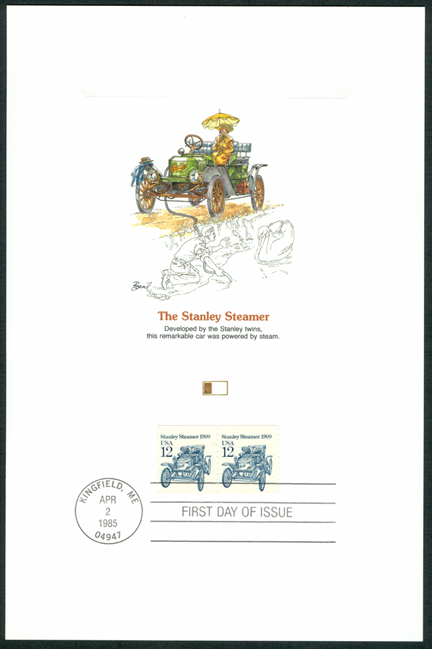 The cover included an insert with a short history of the White steam Car..
Of course, anyone can put anything on an envelope to create a first day cover, and some unmarked Stanley First Day Covers have art work applied in 2009 and 2011, to name just a few that have appeared on eBay. 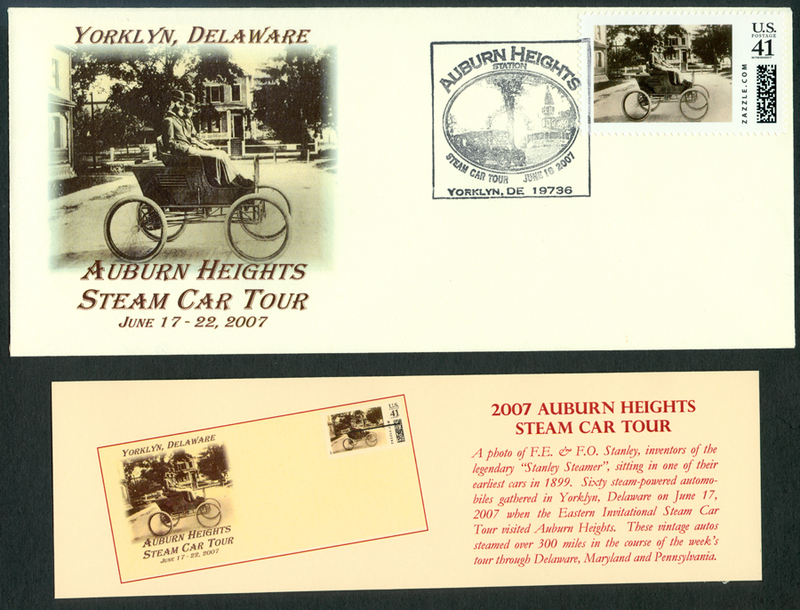 Tom Marshall had these postal covers created for the Auburn Heights Steam Tour at Yorklyn, DE in June 2007. 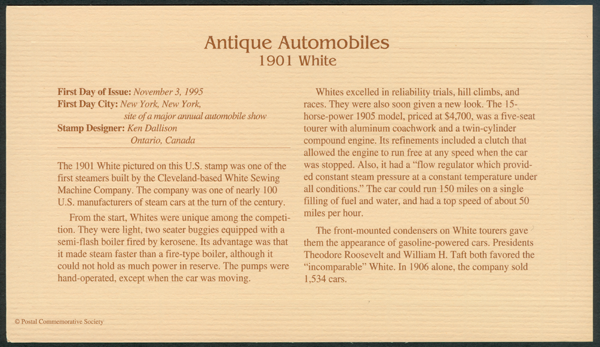 Tour participants were required to be at the museum during a certain time to receive these special cancellations. 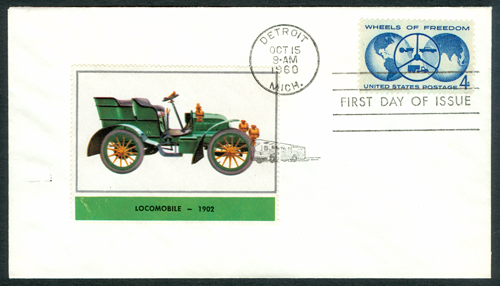 The Locomobile pictured on this Wheels of Freedom first day cover appears to be a few years later than 1902. 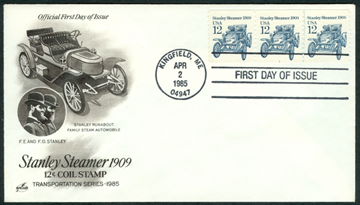 The Stanley Musem created these stickers for the 2006 Centennial of Speed event in Ormond Beach, FL. 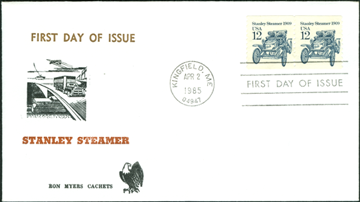 United States Postal Service Official Program. 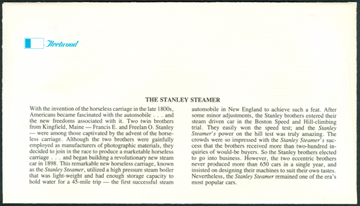 The USPS Official Program is shown in four individual scans because the Virtual Steam Car Museum does not have a large format scanner. 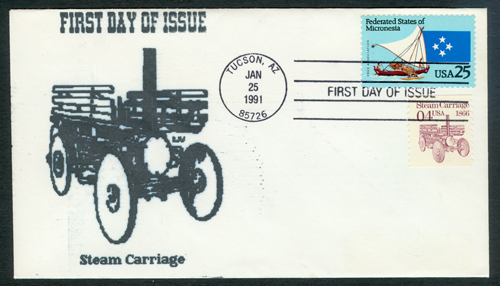 4 Cent Steam Wagon Stamp. 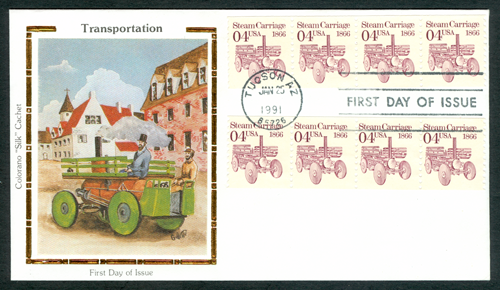 The USPS Transportation series contained a second steam vehicle, a Steam Carriage that looks as if it is the Dudgeon Steam Wagon. 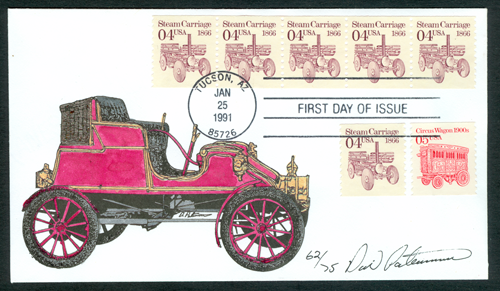 While there were some first day covers made for this stamp's first day of issue on January 25, 1991 in Tucson, AZ, there are not nearly the number made for the 12 cent Stanley Steamer stamp. 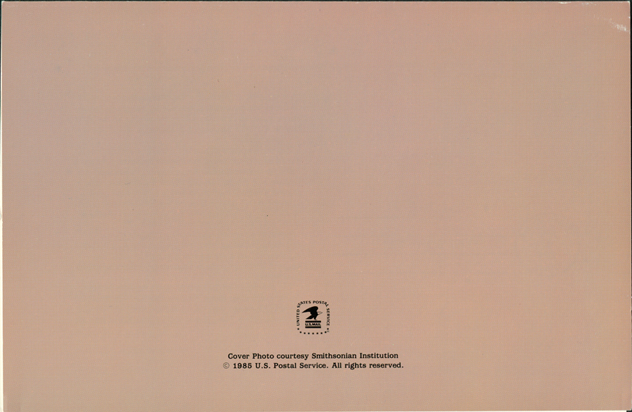 This is the Artmaster Company's cachet. 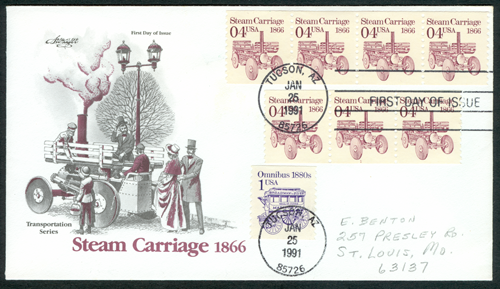 It was apparently mailed to St. Louis, MO, as it requried an extra one-cent stamp. 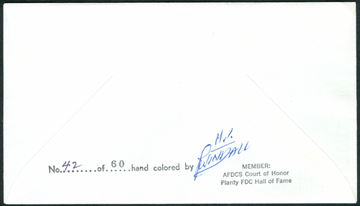 This cachet carries the name Colorano "Silk" Cachet. 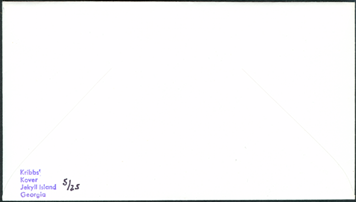 Compare it with the Colorano cachet above. 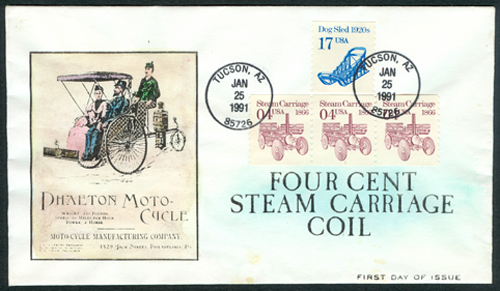 This cachet carries an advertisement for the Moto-Cycle Manufacturing Company of Philadelphia, PA, which is rather different than the Dudgeon Steam Wagon. 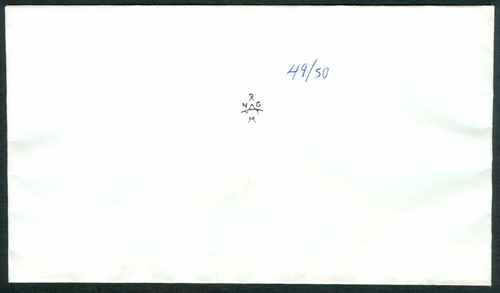 It is number 49 of a limited edition of 50. 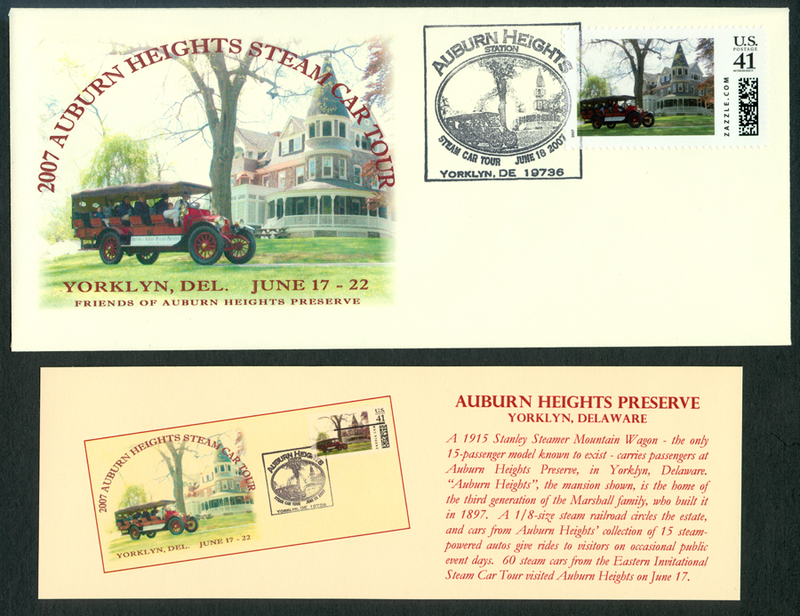 This cachet is number 62 of a limited edition of 75 by David Petermann. 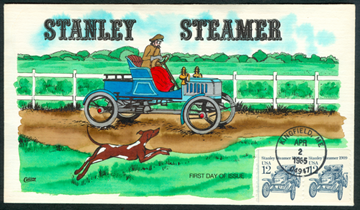 The vehicle seems to be an early tiller-steer Stanley. 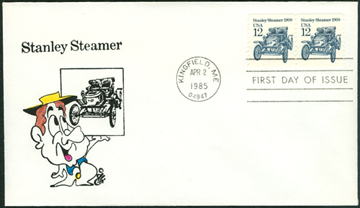 This cartoon suggests a Stanley or Locomobile steamer, but the stamp is an entirely different vehicle. Created by SPAZ, this is the 103rd of the 103 limited editions he created. 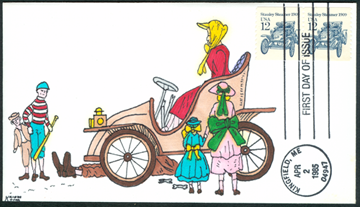 This somewhat crude cachet captures the image created on the stamp.